Mounting clamps are sold in pairs. Powerpole connectors and screws are not included. Please refer to the technical drawing PDF for mounting dimensions. The tabs that separate the connectors--like the tines in a comb break off too easily. It would be better to make this from brass rather than aluminum. I had to make a new one (with sheet brass) because one of the tines broke during assembly. I'm an experiences designer and builder. I agree with the Keystone idea, the number of panels that come pre-punched with keystone sized holes is enormous. I actually have a need where I would mix other Keystone sized connectors and Powerpoles. My career spans the radio and telecommunications world. So I was disappointed to find no clear solution to rackmount any Anderson distro for DC in a 19" rackmount. My suggestion is a square "keystone jack" such as those from Leviton - the keystone modular jack is an industry standard, multi-vendor solution which is a square hole and I can get 19" panels with multiple keystone holes. 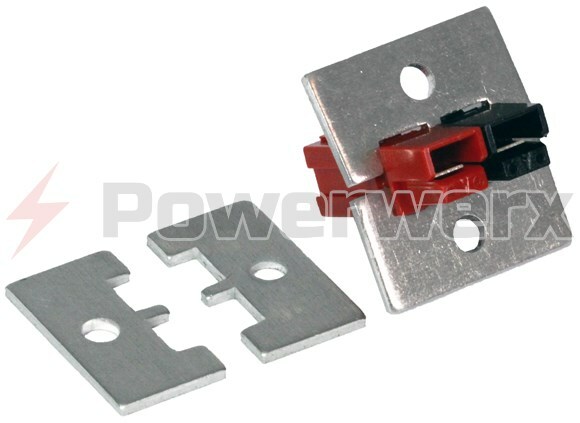 Make a 2 conductor keystone that snaps on with 2 connectors. Google Leviton telecom keystone jacks - they make every kind of connector from USB to VGA to Coax to RCA to HDMI to RJ45. Having an Anderson Powerpole keystone would be awesome. We can then mount in all the various keystone jack mounts and since this is still low-voltage it's completely NECA compliant and legal. Use a 3/4" knockout punch, put the powerpoles together, put this bracket around them , drop it in the hole from the punch and drill the screw mounting holes. A 2x2 block of connectors is ~0,90" corner to corner. And 3/4 conduit has a nominal id of about 7/8, so it would be a little small to fit the 2x2 block of powerpoles. your idea is great in concept, we need to knock on anderson for the it, looks like a 1 1/4 pipe size would work well. Drilling and punching clean round holes is easy. Rectangular holes? Not so easy. Why not offer a Powerpole "keystone" designed to be mounted in a round hole? What size? 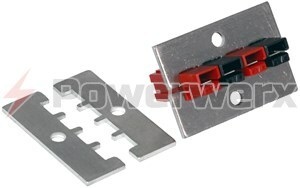 How about the common half-inch conduit size used by Greenlee punches and the entire electrical industry? Heck, even my grocery store sells jboxes and wall plates with half-inch knockouts. Forget the cliche; putting a square peg in a round hole is the only way to go.